On the ion-inertial-range density-power spectra in solar wind turbulence Turbulent solar wind density-power spectral density Rudolf A. Treumann et al. A model-independent first-principle first-order investigation of the shape of turbulent density-power spectra in the ion-inertial range of the solar wind at 1 AU is presented. Demagnetised ions in the ion-inertial range of quasi-neutral plasmas respond to Kolmogorov (K) or Iroshnikov–Kraichnan (IK) inertial-range velocity–turbulence power spectra via the spectrum of the velocity–turbulence-related random-mean-square induction–electric field. Maintenance of electrical quasi-neutrality by the ions causes deformations in the power spectral density of the turbulent density fluctuations. Assuming inertial-range K (IK) spectra in solar wind velocity turbulence and referring to observations of density-power spectra suggest that the occasionally observed scale-limited bumps in the density-power spectrum may be traced back to the electric ion response. Magnetic power spectra react passively to the density spectrum by warranting pressure balance. This approach still neglects contribution of Hall currents and is restricted to the ion-inertial-range scale. While both density and magnetic turbulence spectra in the affected range of ion-inertial scales deviate from K or IK power law shapes, the velocity turbulence preserves its inertial-range shape in the process to which spectral advection turns out to be secondary but may become observable under special external conditions. One such case observed by WIND is analysed. We discuss various aspects of this effect, including the affected wave-number scale range, dependence on the angle between mean flow velocity and wave numbers, and, for a radially expanding solar wind flow, assuming adiabatic expansion at fast solar wind speeds and a Parker dependence of the solar wind magnetic field on radius, also the presumable limitations on the radial location of the turbulent source region. Treumann, R. A., Baumjohann, W., and Narita, Y.: On the ion-inertial-range density-power spectra in solar wind turbulence, Ann. Geophys., 37, 183-199, https://doi.org/10.5194/angeo-37-183-2019, 2019. The solar wind is a turbulent flow with an origin in the solar corona. It is believed to become accelerated within a few solar radii in the coronal low-beta region. Though this awaits approval, it is also believed that its turbulence originates there. Turbulent power spectral densities in the solar wind have been measured in situ at around 1 AU for several decades already. They include spectra of the magnetic field (e.g. Goldstein et al., 1995; Tu and Marsch, 1995; Zhou et al., 2004; Podesta, 2011, for reviews, among others), but with improved instrumentation also of the fluid velocity (Podesta et al., 2007; Podesta, 2009; Šafránková et al., 2013), electric field (Chen et al., 2011, 2012, 2014a, b), temperature (Šafránková et al., 2016), and (starting with Celnikier et al., 1983, who already reported its main properties) also of the (quasi-neutral) solar wind density (Chen et al., 2012, 2013; Šafránková et al., 2013, 2015, 2016). Complementary to the measurements in situ, the solar wind, ground-based observations of radio scintillations from distant stars, originally applied (Lee and Jokipii, 1975, 1976; Cordes et al., 1991; Armstrong et al., 1995) to the interstellar medium (ISM; for early reviews, e.g. Coles, 1978; Armstrong et al., 1981) and used for extra-heliospheric plasma diagnosis (cf., Haverkorn and Spangler, 2013), also provided information about the solar wind density turbulence (Coles and Harmon, 1989; Armstrong et al., 1990; Spangler and Sakurai, 1995; Harmon and Coles, 2005) mostly at solar radial distances <60R⊙≈0.25 AU in the innermost very low solar wind (0.1<βi<1; e.g. the model of McKenzie et al., 1995) region, which is of particular interest because it is the presumable source region of the solar wind, being accessible only remotely. Solar wind turbulence generated here seems to freeze1 and is transported radially outward afterwards by the flow. Radio-phase scintillation of spacecraft signals from Viking, Helios, and Pioneer have been used early on (Woo and Armstrong, 1979) to determine solar wind density-power spectra in the radial interval ≤1 AU, reporting mean spectral Kolmogorov slopes ∼-5/3 with a strong flattening of the spectrum near the Sun at distances <30R⊙ where the slope flattens down to ∼-7/6=-1.1, a finding which suggests evolution of the density turbulence with solar distance. In the ISM radio scintillation, observations covered a huge range of decades, from wavelength scales λ≈15 AU down to close to the Debye length λD≈50 m, suggesting an approximate Kolmogorov spectrum over 7 decades. From recent in situ Voyager 1 observations of ISM electron densities (Gurnett et al., 2013) a Kolmogorov spectrum has been inferred down to wavelengths of λ∼106 m that is followed by an adjacent spectral intensity excess on the assumed kinetic scales for wavelengths λ≳λD (Lee and Lee, 2019). Density fluctuations δN are generally inherent to pressure fluctuations δP. From fundamental physical principles, it follows that density turbulence does not evolve by itself. Through the continuity equation, it is related to velocity turbulence, which in its course requires the presence of free energy, being driven by external forces. It is primary, while turbulence in density, temperature, and the magnetic field is secondary (for a different claim, see Howes and Nielson, 2013; Nielson et al., 2013). Density turbulence may signal the presence of a population of compressive (magneto-acoustic-like) fluctuations in addition to the usually assumed (e.g. Biskamp, 2003; Howes, 2015) alfvénic turbulence, the dominant fluid–magnetic fluctuation family dealing with the mutually related alfvénic velocity and magnetic fields made use of in magnetohydrodynamic (MHD) theory based on Elsasser variables (Elsasser, 1950). The angular brackets 〈…〉 indicate averaging over the spatial scales of the turbulence with respect to turbulent fluctuations. Alfvénic fluctuations (e.g. Howes, 2015, for a recent theoretical account of their importance in MHD turbulence) compensate separately due to their magnetic and velocity fluctuations being related; they do not contribute to extra compression. In order to infer the contribution of density fluctuations, one compares their spectral densities with those of the temperature δT or magnetic field δB. This requires normalisation to the means. Solar wind densities at 1 AU are of the order of N0∼10 cm−3, while ion thermal speeds are of the order of vi∼30 km s−1. 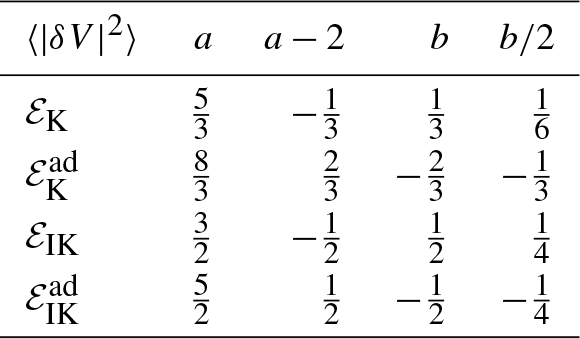 Moreover, mean plasma betas are of the order of βi∼1 here. For checking pressure balance, measured density fluctuations can be compared with those two. An example is shown in Fig. 1 based on solar wind measurements on 6 July 2012 (Šafránková et al., 2015, 2016). There is not much freedom left in choosing the mean densities and temperatures in Fig. 1. 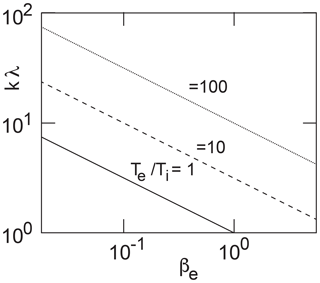 Densities at 1 AU barely exceed 10 cm−3. Electron temperatures are insensitive to those low-frequency density fluctuations. High mobility makes electron reaction isothermal. Figure 1Normalised solar wind power spectra of turbulent temperature and density fluctuations. The curves are based on data from Šafránková et al. (2016) obtained on 6 July 2012 from the Bright Monitor of the Solar Wind (BMSW) instrument aboard the Spektr-R spacecraft. The solar wind conditions of these observations have been tabulated (Chen et al., 2014a). They indicate rather slow compared to medium conditions. The data have been rescaled and normalised to the main density N0 and temperature T0 in order to show their relative contributions to an assumed solar wind pressure balance. The interesting result is that in the lowest MHD frequency range density fluctuations are irrelevant with respect to pressure balance. At higher frequencies, however, the density fluctuations dominate the temperature fluctuations. The data in Fig. 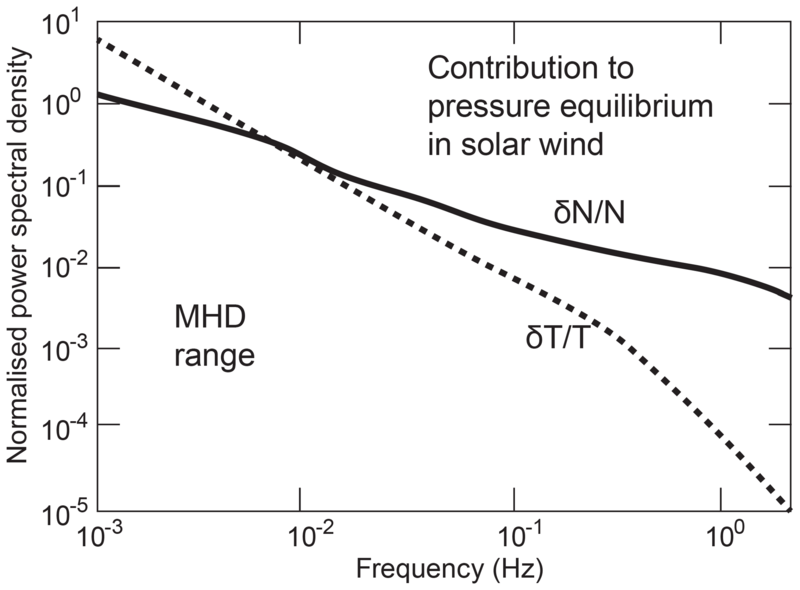 1 show the relative dominance of density fluctuations over ion temperature fluctuations under moderately low-speed solar wind conditions at all frequencies larger than the lowest accessible MHD frequencies. This is not surprising because one would not expect large temperature effects. Ion heating is a slow process which does not react to any fast pressure fluctuations caused by density or magnetic turbulence. It just shows that the turbulent thermal pressure is mainly due to density fluctuations over most of the frequency range. In the low-frequency MHD range the kinetic pressure of large-scale turbulent eddies dominates. Inertial-range power spectra of turbulent density fluctuations are power laws. Occasionally they exhibit pronounced spectral excursions from their monotonic course prior to dropping into the dissipative range. Whenever this happens, the spectrum flattens or, in a narrow range of scales, even turns to positive slopes, sometimes dubbed spectral “bumps”. The reason for such spectral excesses still remains unclear. Similar bumps have also been seen in electric field spectra (e.g. Chen et al., 2012), where they have tentatively been suggested to indicate the presence of kinetic Alfvén waves which may be excited in the Hall-MHD (e.g. Huba, 2003) range as eigenmodes of the plasma. Models including Alfvén ion-cyclotron waves (Harmon and Coles, 2005) or kinetic Alfvén waves (Chandran et al., 2009) have been proposed to cause spectral flattening. Kinetic Alfvén waves may also lead to bumps if only βi≪1. In fact, kinetic Alfvén waves possess a large perpendicular wave number k⟂λi∼1 of the order of the inverse ion-inertial length (e.g. Baumjohann and Treumann, 1996), the scale on which ions demagnetise. If sufficient free energy is available, they can thus be excited and propagate in this regime (e.g. Gary, 1993; Treumann and Baumjohann, 1997). Recently Wu et al. (2019) provided kinetic-theoretical arguments for kinetic Alfvén waves contributing to turbulent dissipation in the ion-inertial scale region. Causing bumps, the waves should develop large amplitudes on the background of general turbulence, i.e. causing intermittency. This requires the presence of a substantial amount of unidentified free energy, for instance in the form of intense plasma beams, which are very well known in relation to collisionless shocks both upstream and downstream (e.g. Balogh and Treumann, 2013). If kinetic Alfvén waves are unambiguously confirmed (see, e.g. Salem et al., 2012), the inner solar wind at ≲0.6 AU could be subject to the continuous presence of small-scale collisionless shocks, a assumption that is not unreasonable and which would be supported by observation of sporadic nonthermal coronal radio emissions (type I through type IV solar radio bursts). In the present note we take a completely different model-independent point of view, avoiding reference to any superimposed plasma instabilities or intermittency (e.g. Chen et al., 2014b). We do not develop any “new theory” of turbulence. Instead, we remain in the realm of turbulent fluctuations, asking for the effect of ion inertia, with respect to ion demagnetisation in the ion-inertial Hall-MHD range, on the shape of the inertial-range power spectral density which will be illustrated referring to a few selected observations. To demonstrate pressure balance we refer to related magnetic power spectra, both measured in situ aboard spacecraft, which require a rather sophisticated instrumentation. Those measurements were anticipated by indirectly inferred density spectra in the solar wind (Woo, 1981; Coles and Filice, 1985; Bourgeois et al., 1985) and the interstellar plasma (Coles, 1978; Armstrong et al., 1981, 1990) from detection of ground-based radio scintillations. In the next section we discuss the response of demagnetised ions to the presence of turbulence on scales between the ion and electron inertial lengths. We interpret this response as the consequence of electric field fluctuations in relation to the turbulent velocity field. The requirement of charge neutrality maps them to the density field via Poisson's equation. The additional contribution of the Hall effect can be separated. We then refer to turbulence theory, assuming that the mechanical inertial-range velocity–turbulence spectrum is either Kolmogorov (K) or Iroshnikov–Kraichnan (IK) and, in a fast-streaming solar wind under relatively weak conditions (Treumann et al., 2019), maps from wave number k into a stationary observer's frequency ωs space via Taylor's hypothesis (Taylor, 1938). In order to be more general, we split the mean flow velocity into bulk V0 and large-eddy U0 velocities, the latter being known (Tennekes, 1975) to cause Doppler broadening of the local velocity spectrum at a fixed wave number (reviewed and backed by numerical simulations by Fung et al., 1992; Kaneda, 1993). Imposing the theoretical K or IK inertial-range spectra, we then find the deformed power density spectra of density turbulence versus spacecraft frequency. We apply these to some observed spectral density bumps which we check on a measured magnetic power spectrum for pressure balance. The results are tabulated. Since bumpy spectra are rather rare, we also consider two more “normal” bumpless spectra. Such deformed density-power spectra which exhibit some typical spectral flattening were obtained under different solar wind conditions. The paper concludes with a brief discussion of the results. Our main question concerns the cause of the occasionally observed scale-limited bumps in the turbulent density-power spectra, in particular their deviation from the expected monotonic inertial-range power law decay towards high wave numbers prior to entering the presumable dissipation range. The philosophy of our approach is the following. Turbulence is always mechanical, i.e. in the velocity. It obeys a turbulent spectrum which extends over all scales of the turbulence. In a plasma, containing charged particles of different mass, these scales for the particles divide into magnetised, inertial, unmagnetised, and dissipative groups. On each of these intervals, the particles behave differently, reacting to the turbulence in the velocity. In the inertial range, the particles lose their magnetic property. They do not react to the magnetic field. They, however, are sensitive to the presence of electric fields, independent of their origin. Turbulence in velocity in a conducting medium in the presence of external magnetic fields is always accompanied by turbulence in the electric field due to gauge invariance, namely the Lorentz force. This electric field affects the unmagnetised component of the plasma, the ions in our case, which to maintain quasi-neutrality tend to compensate it. Below we deal with this effect and its consequences for the density-power spectrum. For later use, we split the main velocity field 〈V〉=V0+U0 into the bulk flow (convection) V0 and an advection velocity U0. The latter is the mean velocity of a small number of large eddies which carry the main energy of the turbulence. Even for stationary turbulence, they advect the bulk of small-scale eddies around at speed U0 (Tennekes, 1975; Fung et al., 1992). The second of these equations is of no interest, because the low-frequency parallel electric field its right-hand side produces is readily compensated by electron displacements along B0. This leaves us with the fluctuating perpendicular induction field in the first Eq. (2). Here, any parallel advection U0‖ attributes to the perpendicular velocity fluctuations from perpendicular magnetic fluctuations δB⟂. On the other hand, any present parallel compressive magnetic fluctuations δB‖=B0(δB‖/B0) contribute through perpendicular advection U0⟂. In their absence, when the magnetic field is non-compressive, the last term disappears. Even for U0‖=0, it contributes through the turbulent fluctuations in the magnetic field. As both these contributions depend only on δB, we can isolate them for separate consideration. 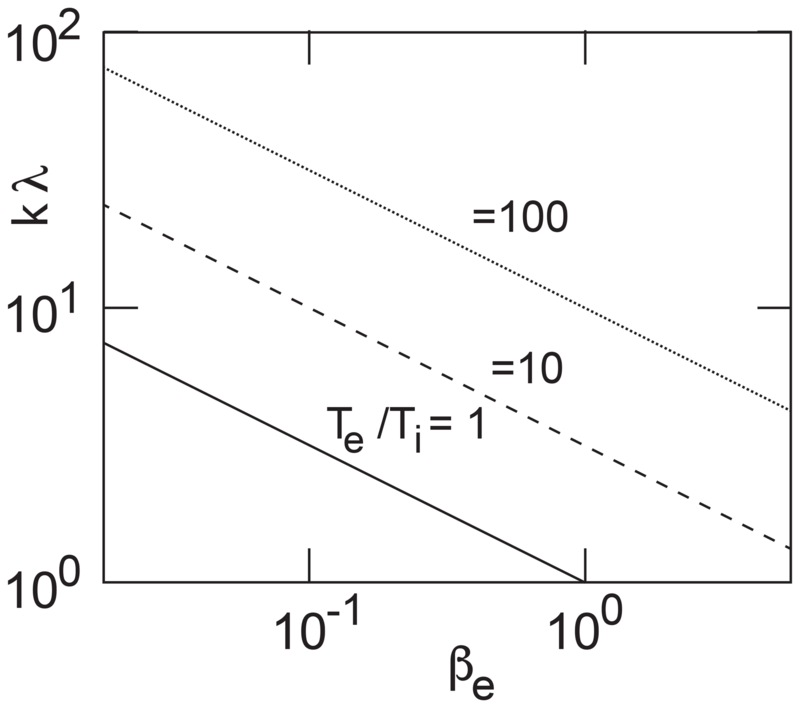 One observes that, in the absence of any compressive magnetic components δB‖ and homogeneity along the mean-field ∇‖=0, there is no contribution of the turbulent Hall term to the electric induction field. In that case only velocity turbulence contributes. Below we consider this important case. Let us assume that advection by large-scale energy-carrying eddies is perpendicular U0=U0⟂, and there are no compressive magnetic fluctuations δB‖=0. In Eq. (2) this reduces to considering only the first term containing the velocity fluctuations. We ask for its effect on the density fluctuations in the ion-inertial domain on scales where the ions demagnetise. Again it becomes obvious that absence of parallel (compressive) magnetic turbulence eliminates the first term in this expression, while purely perpendicular propagation eliminates the second term. Alfvénic turbulence, for instance, with δB‖=0 and k⟂=0, has no Hall effect on the modulation of the density spectrum, a fact which is well known. On the other hand, for perpendicular wave numbers k=k⟂ only compressive Hall-magnetic fluctuations δB‖k⟂ contribute to the Hall fluctuations in the density δNk⟂H. We are interested in the power spectrum of the turbulent density fluctuations in the proper frame of the turbulence. where VA2=B02/μ0miN0 is the squared Alfvén speed, and ωi2=e2N0/ϵ0mi is the squared proton plasma frequency. As expected, in order to contribute to density fluctuations, perpendicular scales λ⟂<λi smaller than the ion-inertial length λi=c/ωi are required, while in the long-wavelength range k⟂λi<1, there is no effect on the spectrum. This is in agreement with the assumption that any spectral modification is expected only in the ion-inertial range. The last equation is the main formal result. It is the wanted relation between the power spectra of density and velocity fluctuations. It contains the response of the unmagnetised ions to the mechanical turbulence. The electron plasma beta in the solar wind is of the order of βe≳O(1). However, the temperature ratio Te∕Ti is variable and usually large, varying between a few and a few tens. Thus usually βi<1. Figure 2 shows a graph of this dependence. Figure 2The range of permitted values of k⟂λi as function of βe for different ratios Te∕Ti. Only the range above the lines is relevant. In the solar wind, usually Te>Ti, implying that βe>βi (Newbury et al., 1998; Wilson III et al., 2018) unless the electrons become cooled by some process like emitting radiation, electron hole formation, or charge exchange. The power spectrum of the Poisson-modified ion-inertial-range density turbulence can be inferred once the power spectral density of the velocity is given. This spectrum must either be known a priori or requires reference to some model of turbulence. We do not develop any model of turbulence here. In application to the solar wind we just make us, in the following, of the Kolmogorov (K) spectrum (or its anisotropic extension by Goldreich and Sridhar, 1995, abbreviated KGS) but will also refer to the IK spectrum, which both have previously been found to be of relevance in solar wind turbulence. We shall make use of those spectra in two forms: the original ones which just assume stationarity and absence of any bulk flows and their modified advected extensions. The latter account for a distinction between a small number of large energy-carrying eddies with mean eddy vortex speed U0 and bulk turbulence consisting of large numbers of small energy-poor eddies which are frozen to the large eddies. The large eddies stir the small-scale turbulence, forcing it into advective motion (Tennekes, 1975). This causes a Doppler broadening of the wave-number spectrum at fixed k and has been confirmed by numerical simulations (Fung et al., 1992; Kaneda, 1993). Below, it will be found that this advection cannot be resolved in bulk convective flow which buries the subtle effect of Doppler broadening. 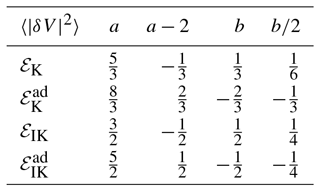 A probable counterexample is shown in Fig. 5. 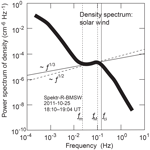 Figure 3Solar wind power spectra of turbulent density fluctuations (based on BMSW data from Šafránková et al., 2013, obtained on 25 October 2011). Single point measurements were obtained with six Faraday cups with time resolution of 31 ms (∼30 Hz) under the following solar wind conditions: density N∼3×106 m−3, mean magnetic field B0∼8 nT, bulk speed V0∼540 km s−1, ion temperature Ti∼10 nT, Alfvén Mach number MA∼6, and total β∼0.3, implying dilute low β (high MA) and moderately fast flow conditions. The local thermal ion gyroradius is ρi∼2.2×104 m. The vertical line indicates the local ion-cyclotron frequency fci=ωci/2π≈0.15 Hz. Plasma frequency is fi=ωi/2π≈400 Hz. fm and fM are the approximate minimum and maximum frequencies of the bumpy range, respectively. The data were averaged over ∼1200 s measuring time and subsequently filtered (cf. Šafránková et al., 2016, for the description of the data reduction). The spectrum shown is the average spectrum with line width roughly corresponding to the largest spread of the filtered data in the logarithmic ordinate direction and applied to the whole spectrum. The power spectrum exhibits a (so-called) bump at intermediate frequencies of positive slopes ∼ω⅓ or ∼ω½. This is in agreement with it being caused by the response of the non-magnetic ions to the electric induction field of the turbulent mechanical fluctuations in the solar wind velocity in Kolmogorov (K; solid line) or Iroshnikov–Kraichnan (IK; dashed line) inertial-range turbulence. The large scatter in the data (weight of line) inhibits distinguishing between K and IK inertial-range velocity turbulence. with CK≈1.65 as Kolmogorov's constant of proportionality (as determined by Gotoh and Fukayama, 2001, using numerical simulations). Clearly, in a fast-streaming solar wind, when straightforwardly mapping this K spectrum by the Taylor hypothesis (Taylor, 1938) into the stationary spacecraft frame, the spectral index is unchanged, and one trivially recovers the ωs-53 Kolmogorov slope in frequency space. In the stationary turbulence frame the power spectrum of turbulence in the velocity decays to ∝k-83 with non-Kolmogorov spectral index 8/3≈2.7. It is of particular interest to note that solar wind turbulent power spectra at high frequency repeatedly obey spectral indices very close to this number. Boldly referring to Taylor's hypothesis where ωs∝k, one might conclude then that a convective flow maps this spectral range of the advected turbulent K spectrum into the spacecraft frame where it appears as an ωs-83 spectrum. If this is true, then the corresponding observed spectral transition (or break point) from the spectral K index ∼5/3 to the steeper index ∼8/3 observed in the large-wave-number power spectra indicates the division between large-scale energy-carrying, energy-rich turbulent eddies and the bulk of energy-poor small-scale eddies in the mechanical turbulence. It thus provides a simple explanation of the change in spectral index from ∼5/3 (K spectrum) to ≲3 (advected K turbulence spectrum) without invoking any sophisticated turbulence theory as well as having no effects of dissipation. Approaching from the Kolmogorov inertial range towards a smaller k, one observes flattening until kmin<kin. In most cases this point will lie outside the observation range. which, as before for large ωs, is of the spectral index 8∕3. With decreasing spacecraft frequency ωs, the exponential correction factor acts to suppress the spectrum. This corresponds to a spectral flattening towards smaller ωs. It might even cause a spectral dip, depending on the parameters and velocities involved. The effect is strongest for aligned streaming and the eddy wave number. For α∼90∘ one recovers the index 8∕3. It is most interesting that spectral broadening, when transformed into the spacecraft frame in streaming turbulence, causes that strong of a difference between the original Kolmogorov and the advected Kolmogorov spectrum. This spectral behaviour is still independent of the Poisson modification, which we are going to investigate in the next section. Here we apply the Poisson-modified expressions to the theoretical inertial-range K and IK turbulence models. We concentrate on the inertial-range K spectrum and rewrite the result subsequently to the IK spectrum. with factor of proportionality CK(ϵ0B0/e)2(ϵ2/V0cosα)13. Hence, the effect of the Poisson response of the plasma to the inertial-range power spectra of K and IK turbulence in the velocity is to generate a positive slope in the density-power spectrum when transformed by Taylor's Galilei transformation into the spacecraft frame. We now proceed to the investigation of the effect of advection. This is the proper frequency dependence of the advected turbulent density spectrum in the turbulence frame. Here kir≈2πωi/c (or 2πvi∕ωci) is the wave number presumably corresponding to the lower end of the ion-inertial range. The upper bound on the frequency ωu remains undetermined. One assumption would be that ωu is the lower-hybrid frequency which is intermediate to the ion and electron cyclotron frequencies. At this frequency electrons become capable of discharging the electric induction field, thus breaking the spectrum to return to its Kolmogorov slope at increasing frequency. In contrast to the Kolmogorov law, the Poisson-mediated proper advected density-power spectrum Eq. (18) increases with frequency in the proper stationary frame of the turbulence. This increase is restricted to that part of the inertial K range which corresponds to the ion-inertial scale and frequency range. This proper IK density spectrum increases with frequency like the root of the proper frequency. 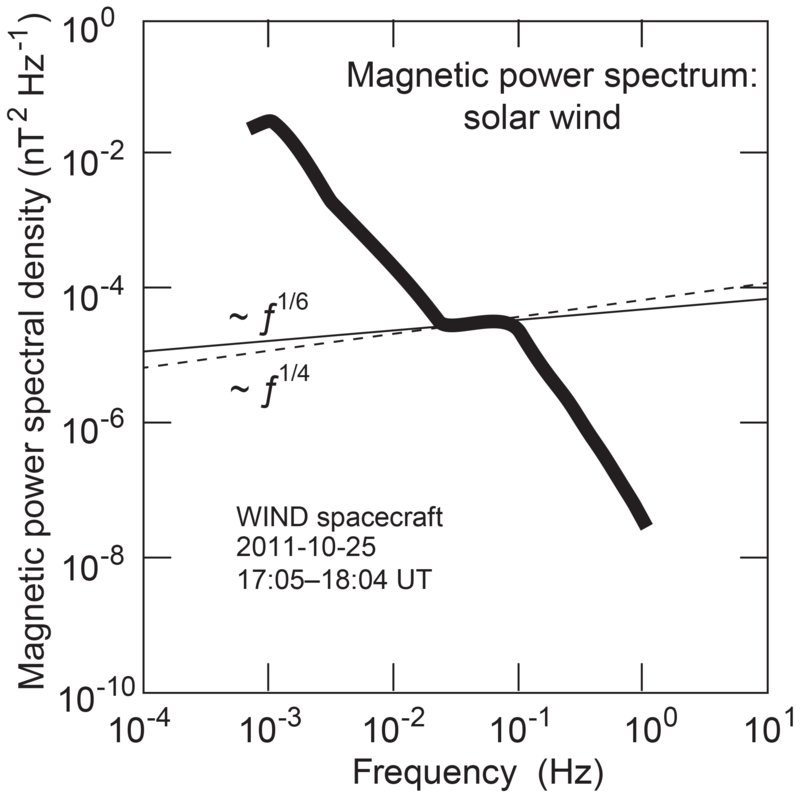 Figure 4Solar wind power spectra of the turbulent magnetic field for the same time interval as in Fig. 3 measured by the WIND spacecraft (data from Šafránková et al., 2013), which was located at the Lagrange point L1. Line width accounts for the scatter of data. The magnetic turbulence spectrum exhibits a deformation similar to that in the density-power spectrum and the same frequency interval. The positive slope ∼ω⅙ in the deformation confirms its origin from pressure balance. It indicates its nature being secondary to turbulence in density. The solid (dashed) line corresponds to an K (IK) velocity spectrum. The scatter of data was again substantial, thus inhibiting distinction between the two cases. In both cases of advected K and IK spectra the Taylor's Galilei transformation from the proper frame of turbulence into the spacecraft frame is permitted because it applies to the velocity and density spectra (Treumann et al., 2019). It maps the wave-number spectrum into the spacecraft frame frequency spectrum. However, in both cases we recover frequency spectra which decrease with frequency though weakly approaching the steepest slope at large frequencies. They flatten out towards low frequencies and may assume maxima only if these maxima are still in the inertial range of the advected K or IK spectrum. Only in this case does the spacecraft frequency spectrum exhibit a bump at their nominal maximum frequencies ωsm. When the maximum frequency falls outside the ion-inertial range the bump will be absent, while the spectrum will be flatter than at large frequencies. Such flattened bumpless spectra have been observed. The next subsections provide examples of observed bumpy and bumpless spectra in the spacecraft frequency frame. In the following two subsections we apply the above theory to real observations made in situ in the solar wind. We first consider density-power spectra exhibiting well-expressed spectral bumps of positive slope. We then show two examples where no bump is present but where the power spectra exhibit a scale-limited excess and consequently a scale-limited spectral flattening. Figure 3 is an example of a density spectrum with respect to spacecraft frequency which exhibits a positive slope (or bump) on the otherwise negative slope of the main spectrum. The data in this figure were taken from published spectra (Šafránková et al., 2013) in the solar wind at an average bulk velocity of V0≈534 km s−1, density N0≈3×106 m−3, and magnetic field B0≈8 nT, yielding a super-alfvénic Alfvén Mach number MA≈6, ion temperature Ti≲3 eV, and total plasma β≈0.3, i.e. low-beta conditions. The straight solid and broken lines drawn across this slope correspond to the predicted ∼ω⅓ K and ∼ω½ IK slopes under convection-dominated conditions. Both these lines fit the shape very well though it cannot be decided which of the inertial-range turbulence models provides a better fit, as the large scatter of the data mimicked by the line width inhibits any distinction. It is however obvious from Table 1 that advection plays no role in this case. In order to check pressure balance between the density and magnetic field fluctuations, we refer to turbulent magnetic power spectra obtained at the WIND spacecraft Šafránková et al. (2013). WIND was located in the L1 Lagrange point. Magnetic field fluctuations were related in time to the Bright Monitor of the Solar Wind (BMSW) observations by the solar wind flow. In spite of their scatter, the data were sufficiently stationary for comparison to the density measurements. Table 1K and IK ion-inertial-range spectral indices k−a, k-(a-2), ωsb, and EBs∼ωsb/2 without and with advection. 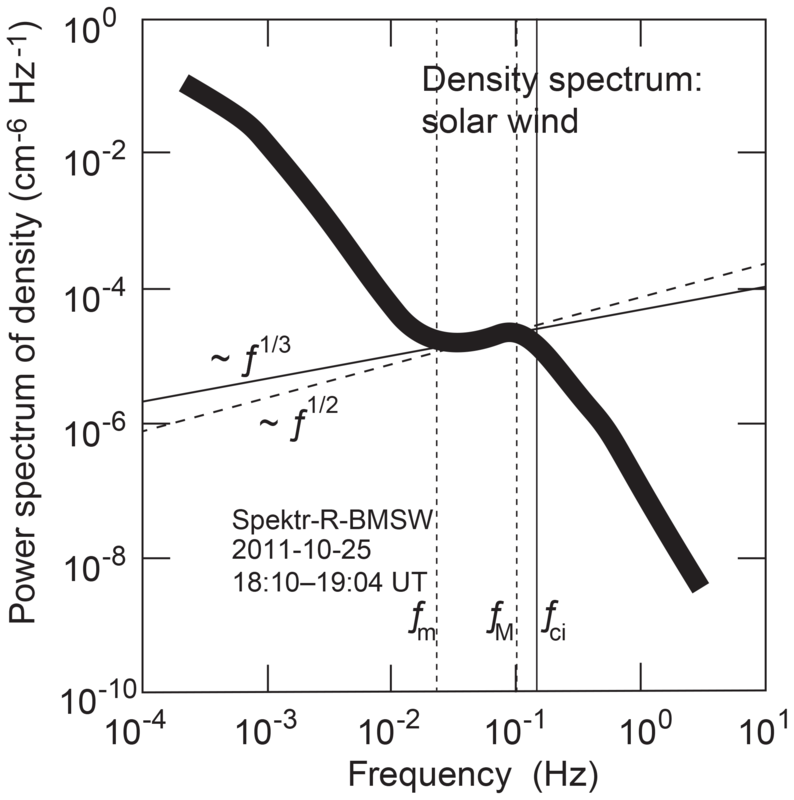 The majority of observed density-power spectra in the solar wind do not exhibit positive slopes. Such spectra are of monotonic negative slope. In this sense they are normal. They frequently possess break points in an intermediate range where the slopes flatten. Two typical examples are shown in Fig. 5, combined from unrelated BMSW and WIND data (Šafránková et al., 2013; Podesta and Borovsky, 2010). 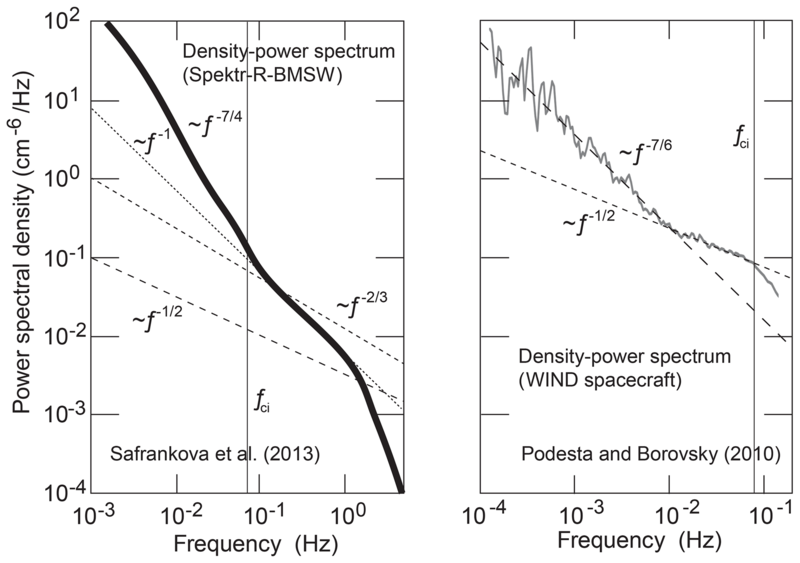 Figure 5Two (redrawn on same scale) cases of normal solar wind density-power spectra measured by Spektr-R-BMSW (Šafránková et al., 2013) on 10 November 2011 and WIND (Podesta and Borovsky, 2010) on 4–8 January 1995 at different solar wind conditions. BMSW observations of 2011 were obtained under low-speed (∼370 km s−1) moderately large total β=βi+βe∼2.5, high Alfvénic Mach number MA∼10, and mean-field B0∼5 nT conditions. Density and temperature amounted to N0∼5×106 m−3 and Ti∼10 eV, with ion-cyclotron fci∼0.08 Hz and plasma fi∼500 Hz frequencies. WIND observations in L1 were obtained under high speed (∼640 km s−1), βi≲1, B0∼6 nT, N0∼3.5×106 m−3, Ti∼20 eV, and MA∼9 conditions with similar cyclotron and plasma frequencies. In contrast to Fig. 3 these spectra do not exhibit regions of positive slope. Their spectral slope is interrupted by a flattened region. 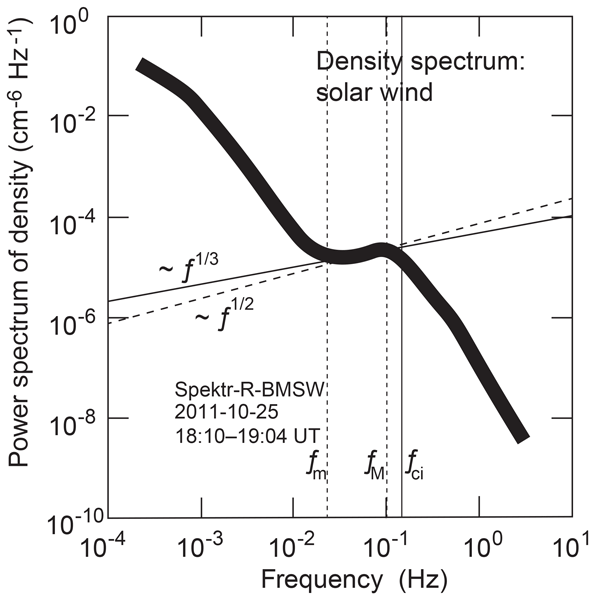 They share a range of spectral index ∼-1, though in different frequency intervals, while the WIND spectrum exhibits a higher-frequency range of flat slope ∼-1/2 which is absent in the BMSW spectrum. Their flattened spectral intervals each extend roughly over 1 decade in frequency. 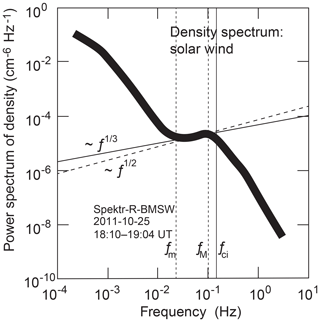 The BMSW spectrum is shifted by 1 order of magnitude in frequency to higher frequencies than the WIND spectrum. Its low-frequency part below the ion-cyclotron frequency f<fci has slope ∼ω-74, close to a K spectrum ∼ω-53. The slope of the flat section is ∼ω-1 which is about the same as the slope of the entire low-frequency WIND spectrum before its spectral break. None of the Poisson-modified K or IK spectral slopes fit these flattened regions. At higher frequencies the BMSW spectrum steepens and presumably enters the dissipative range. The slope of the WIND spectrum above its break point at frequency ∼10-2 Hz decreases to ∼ω-12. This corresponds perfectly to an advected Taylor's Galilei-transformed IK spectrum, suggesting that WIND detected such a spectrum in the ion-inertial range which maps to those spacecraft frequencies. The pronounced ω−1 spectrum at lower frequencies remains, however, unexplained for both spacecraft. When crossing the cyclotron frequency fci, the WIND spectrum steepens. We also note that the normalised power spectral densities of WIND at 〈|δN|2〉/N02>0.3 and BMSW at 0.005<〈|δN|2〉/N02<0.05 in the common slope ∼ω-1 interval are roughly 2 orders of magnitude apart. This can hardly be traced back to the radial difference of 0.01 AU between L1 and 1 AU. The obvious difference between the two plasma states is not in the Mach numbers but rather in β and V0. The BMSW observed, under moderately high-β low-V0 conditions, WIND under moderately low-β high-V0 conditions at similar densities and Mach numbers. Because of the Galilean relation k=ωs/V0cosα, the high speed in the case of WIND seems responsible for the spectral shift in the ωs-1 spectral range to lower than BMSW frequencies. This, however, comes up merely for a factor 2 which does not cover the frequency shift of more than 1 order of magnitude. Rather it is the angle between mean speed and the wave-number spectrum which displaces the spectra in frequency. If this is the case, then the WIND spectrum was about parallel to the solar wind velocity with WIND angle α≈0∘, while the BMSW spectrum was close to being perpendicular with angle α≈90∘, and it is the BMSW spectrum which has been shifted by Taylor's Galilei transformation into the high-frequency domain, while the WIND spectrum is about original. This may also be the reason why BMSW does not see the narrow, flattened spectral part while compressing the ωs-1 part into just 1 order of magnitude in frequency. The near-perpendicular angle α will also be confirmed below in the bumpy BMSW spectral case. In this communication we dealt with the power spectra of density in low-frequency plasma turbulence. We did not develop any new theory of turbulence. We showed that, in the ion-inertial scale range of non-magnetised ions, the electric response of the ion population to a given theoretical turbulent K or IK spectrum of velocity may contribute to a scale-limited excess in the density fluctuation spectrum with a positive or flattened slope. We demonstrated that the obtained inertial-range spectral slopes within experimental uncertainty are not in disagreement with observations in the solar wind, but we could not decide between the models of turbulence. This may be considered a minor contribution only; it shows, however, that correct inclusion of the electrodynamic transformation property is important and suffices for reproducing an observational fact without any need to invoke higher-order interactions, any instability, or nonlinear theory. We also inferred the limitations and scale ranges for the response to cause an effect. However, a substantial number of unsolved problems remain. Below we discuss some of them. The main problem concerns the agreement with observations. Determination and confirmation of spectral slopes is a necessary condition. However, how should the observed frequency range be adjusted? where αm is the angle between km and velocity V0, and λi=c/ωi. The first expression yields Taylor's Galilei-transformed wave number km∼2.3×10-6/cosαm m−1. From the second, we have, with the observed ion plasma frequency, km∼2π×10-6 m−1. Hence we find that cos αm<0.37 or αm>69∘. The turbulent eddies are at highly oblique angles with respect to the flow velocity. With angles of this kind the positive slope spectral range can be explained. The lower frequencies then correspond to eddies which propagate nearly perpendicular. Since our theory is generally restricted to wave numbers perpendicular to the ambient magnetic field, the eddies which contribute to the bumps are perpendicular to B0 and highly oblique with respect to the flow. 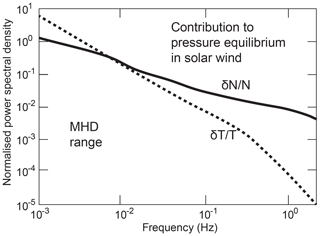 Similar arguments apply to the high-frequency excess in the WIND observations of Fig. 5. Referring to Table 1 this excess is explained as survival of the advected spectrum when Taylor's Galilei transformed into the spacecraft frame. The assumption of Taylor's Galilei transformation in the way we used it (and is generally applied to turbulent solar wind power spectra) is valid only in stationary homogeneous turbulent flows of spatially constant plasma and field parameters6, which in the solar wind is not the case. It also assumes that wave numbers k are conserved by the flow7. Thus the above conclusion is correct only if the turbulence is generated locally and is transported over a distance where the radial variation of the solar wind is negligible. If it is assumed that the turbulence is generated in the innermost heliosphere at a fraction of 1 AU (e.g. McKenzie et al., 1995), any simple application of Taylor's Galilei transformation and thus the above interpretation break down. We conclude that under the assumption of isentropic expansion of the solar wind and Taylor's Galilei transport of turbulent eddies from the source region to the observation site at 1 AU, the generation region of the turbulent eddies which contribute to the bump in the K or IK density-power spectrum must be located close to the Sun. The marginally permitted angle αm between wave number and mean flow is obtained by using rq=1 AU, yielding αm>47∘, meaning that the flow must be oblique for the effect to develop, a conclusion already found above for homogeneous flow. These numbers are obtained under the unproven assumption that Taylor's Galilei transport conserves turbulent wave numbers in the inhomogeneous solar wind. which gives the result αm≳89∘ for the propagation angle obtained above. According to both these estimates eddy propagation is required to be quasi-perpendicular to the flow. This holds under the strong condition that the wave number is conserved during outward propagation. This gives αm≳87∘ which is not too different from the above case. Thus the angle between mean speed and the turbulent wave number is close to perpendicular in order to reconcile the lower observed limit in spacecraft frequency with the wave number in the source region. A similar reasoning can be applied to the upper frequency bound ωM. Following the discussion in the Introduction, this bound is caused by the truncation of the ion-inertial range at large wave numbers when the scale approaches the electron scale, electron inertia takes over, and electrons demagnetise. The condition in this case is that kρe<1, which defines the maximum frequency ωM. Taking the two results for this case together, the observations map to an angle of propagation αm>49∘ and places the turbulent source close to the Sun but outside 11 R⊙≲rq≲1 AU. It occurs only if the turbulence contains a dominant population of eddies obeying wave-number vectors k which are oblique to the mean flow velocity V0. This is in agreement with our given estimate above on the theoretical limits and explains the relative rarity of its observation. Unfortunately, based on the observations, the desired location of the turbulent source region in space cannot be localised more precisely. putting the source region substantially farther out to ≳45R⊙. The latter estimate is, however, quite speculative. Thus the narrowness of the observed bump in frequency poses a serious problem. Its solution is not obvious. The most honest conclusion is that little can be said about the observed upper frequency termination of the bump in Fig. 3 unless an additional assumption is made. One may, however, argue that in a high-βi plasma the gyroradius of the ions is large. The ions are non-magnetic, but the effect can arise only when the wavelength becomes less than the inertial length λm<λi=c/ωi. Similarly the effect will disappear when the wavelength crosses the electron inertial length λM<λe=c/ωe. The ratio of these two limits is λM/λm=fM/fm=mi/me≈43. This agrees approximately with the observation. This interpretation then identifies the range of the effect in spacecraft frequency and source wave number with the range between electron and ion-inertial lengths. Since both evolve radially with the ratio of the root of densities, the relative spectral width should not change from source to spacecraft. This value corresponds to >50βiqR⊙ from the Sun. Since the source must lie inside rq<1 AU, we conclude that βiq≲4.15. This number is just an upper limit. It is consistent with model calculations (McKenzie et al., 1995) which predict βiq<1 shifting the inner boundary of the turbulent source region further in. In this paper, we considered the cases V0=U0=0, V0=0,U0≠0, and V0≠0 for K and IK velocity spectra, where V0 is the velocity of the mean solar wind stream, and U0 is the mean speed of the energy-carrying largest turbulent MHD vortices which advect the bulk of small-scale turbulence around (Tennekes, 1975). In the K and IK models of turbulence, they, in addition, play the role of the energy injectors. The resulting spectral slopes are given as b in the fourth column of Table 1. The input spectral power densities are ℰIK and EIKad. Each of them yields a different ion-inertial scale range power spectrum in k space and, consequently, also a different power law spectrum in ωs space. Table 1 shows that the ordinary spectra acquire positive slopes in wave number k in the frame of stationary and homogeneous turbulence in the turbulence frame. However, observations of this slope in frequency undermine this conclusion, suggesting that it is the ordinary K (IK) velocity turbulence (or if anisotropy is taken into account, the KGS) spectrum in the ion-inertial range which, when convected by the solar wind flow across the spacecraft, deforms the density spectrum. All advected spectra have, in contrast, a negative slope in frequency which in this form disagrees with observation of the spectral bumps. The obtained advected slopes in the stationary turbulence frame are also too far away from the flattest notorious and badly understood negative slope ωs-1 for being related. Their nominal K and IK slopes are -2/3 and -1/2, respectively. This implies that spacecraft observations interpreted as observing the local stationary turbulence do not, in the majority of cases, detect an advected convected spectrum in the ion-inertial K (IK) inertial range. They are, however, well capable of explaining the high-frequency flattened spectral excursion in the WIND spectrum which is shown in Fig. 5. It has the correct advective IK spectral index -1/2 when convected across the WIND spacecraft before the onset of spectral decay. 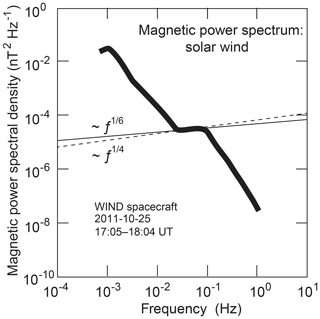 Generally the form of a distorted power spectrum in density depends on the external solar wind conditions. The reconciliation of these with the theoretical predictions and the observation of the spectral range of the distortion is a difficult, mostly observational task. We have attempted it in the discussion section. In particular the proposed bending of the power spectral density in the direction of lower frequencies requires identification of the maximum point of the advected spectrum in frequency and the transition to the undisturbed K or IK inertial ranges. We tentatively tried taking thermodynamic effects in an expanding solar wind into account. This led to preliminary information about the angle between flow and the turbulent wave numbers which contribute to deformation of the spectrum. Some tentative information could also be retrieved in this case about the radial solar distance of the turbulent source region. When thermodynamics come in, one may raise the important question for the collisionless turbulent ion heating 〈δQ˙i〉=-〈δQ˙em〉=〈δJ⋅δE〉 in the ion-inertial range, the negative of the mean loss in electromagnetic energy density per time 〈δQ˙em〉, proportional to the product of current vortices δJ and the turbulent electric field δE. Though of finite magnitude, it is second order. This is left for future investigation. Hall currents do not contribute to any heating. So far we have not taken into account the contribution of Hall spectra. These affect the shape of the density spectrum via the Hall-magnetic field, a second-order effect indeed, though it might contribute to additional spectral deformation. Inclusion of the Hall effect requires a separate investigation with reference to magnetic fluctuations. On those scales the Hall currents should provide a free energy source internal to the turbulence, which is not included in K and IK theory. Hall fields are closely related to kinetic effects in the ion-inertial range. Among them are kinetic Alfvén waves whose perpendicular scales k⟂∼λi-1 agree with the scale of the ion-inertial range. Possibly they can grow on the expense of the Hall field which in this case plays the role of free energy for them. If they can grow to sufficiently large amplitudes, they contribute to further deforming K and IK ion-inertial-range density spectra. Similarly, small-scale shock waves might evolve at the inferred high Mach numbers when turbulent eddies grow and steepen in the small-scale range. These necessarily become sources of electron beams, reflect ions, and transfer their energy in a kinetic-turbulent way to the particle population. Such beams act as sources of particular wave populations which contribute to turbulence, preferably at the kinetic scales of interest. Inclusion of all these effects is a difficult task. It still opens up a wide field for investigation of turbulence on the ion-inertial scale not yet entering the (Treumann and Baumjohann, 2015) collisionless dissipation scale where electrons demagnetise as well and the current filaments dissipate their energy in the process of spontaneous collisionless reconnection as the most probable ultimate energy sink of otherwise collisionless turbulence. The scales of this dissipation process are still far away from any molecular scales. The resulting dissipation is justifiably anomalous. This work was part of a brief Visiting Scientist Programme at the International Space Science Institute Bern. We acknowledge the interest of the ISSI directorate as well as the generous hospitality of the ISSI staff, in particular the assistance of the librarians Andrea Fischer and Irmela Schweitzer, and the system administrator Saliba F. Saliba. We also thank the anonymous reviewer for intriguing comments and criticism. This paper was edited by Elias Roussos and reviewed by one anonymous referee. We do not touch on the subtle question of whether any frozen turbulence on MHD-scales above the ion-cyclotron radius in a low-beta or strong-field plasma can evolve. According to inferred spatial anisotropies, it seems that close to the Sun, turbulence in the density is almost field-aligned. On the other hand, ion-inertial-range turbulence at shorter scales will be much less affected. It can be considered to be isotropic. Near 1 AU, where most in situ observations take place, one has β≳1. One may expect that turbulence here also contains contributions which are generated locally, if only some free energy would become available. This equation is easily obtained by standard methods when splitting the fields in the ideal (collisionless) Hall-MHD Ohm's law: E=-V×B+(1/eN)J×B, with E,B,V,J electric, magnetic, and current fields, into mean (index 0) and fluctuating fields according to E=E0+δE etc. ; averaging over the fluctuation scales, with 〈…〉 indicating the averaging procedure, yields the mean-field electric field equation. Subtracting it from the original equation produces the wanted expression of the turbulent electric fluctuations δE through the mean and fluctuating velocity and magnetic fields. The procedure of obtaining the power spectrum is standard, so we skip the formal steps which lead to this expression. One may object that, at smaller wave numbers outside the ion-inertial range, this would also be the case, which is true. There, reference to the continuity equation, for advection speeds U0≠0, yields 〈|δN|2〉k=N02〈|k⋅δV|2〉k/(k⋅U0)2, which is obtained without reference to Poisson's equation. However, its dependence on the wave number is different, and, in addition, it is undefined for vanishing advection. In the absence of advection the density spectrum is determined from the equation of motion by simple pressure balance. The notion of a turbulent dispersion relation is alien to turbulence theory, which refers to stationary turbulence, conveniently collecting any temporal changes under the loosely defined term intermittency. However, observation of stationary turbulence shows that eddies come and go on an internal timescale, which stationary theory integrates out. In Fourier representation this corresponds to an integration of the spectral density S(ωk,k) with respect to frequency ωk (e.g. Biskamp, 2003), which leaves only the wave-number dependence. The spectral density S occupies a volume in (ω,k) space. Resolved for ω=ωk(k), it yields a complex multiply connected surface, the turbulent dispersion relation, which has nothing in common with a linear dispersion relation resulting from the solution of a linear eigenmode wave equation. It contains the dependence of Fourier frequency ωk on Fourier wave number k. Though this should be common sense, we feel obliged to note this here because of the confusion caused when speaking about a “dispersion relation” in turbulence. For general restrictions on its applicability already in homogeneous MHD, see Treumann et al. (2019). This is a strong assumption. In the absence of dissipation, individual frequencies are conserved. They correspond to energy. Wave numbers correspond to momenta which do not obey a separate conservation law.